From easy to strenuous, some of the best day hikes near Nashville may be hiding from you in plain sight. These days Nashville is booming and is the the place to live in Tennessee. It is number seven on Forbes 2018 list of America’s fastest growing cities. Even so, Nashville has has a lot of natural beauty. 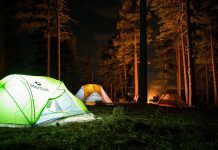 There are many state parks and wonderful hiking trails and if you are reading this article then I’m assuming that’s what you are looking for. However, the further east you go in Tennessee, the more beautiful the landscape gets and the more hiking opportunities you are going to get. If you are willing to travel an hour or so east of Nashville, then I would suggest checking out this article I wrote on waterfall hikes near Cookeville Tennessee. There are some great ones on this list. So let me cut to the chase and get right to it. Here is a list of locations that I’ve compiled of where you can find some of the best day hikes near Nashville. At Radnor Lake State Park you will find 9 different hiking trails all under 2 miles one way ranging from easy to moderate with just two being rated as difficult. Surprisingly, 4 of these trails are handicap accessible. Radnor Lake is a very popular sport for hiking in south Nashville so if you plan to go keep that in mind. If going on a pretty day, I suggest arriving early before the crowd as parking can sometimes be tricky. gravel, rated easy. A short stroll located along the west side of the lake. Hall Road Historic Valve House Trail – .4 miles, located on west side of lake near visitor’s center, rated easy. The valve house has been recently rebuilt and makes for a nice, short hike. Lake Trail – 1.35 miles, handicap accessible, mulch/gravel, rated easy. Start at the west side parking lot and walk along the south side of the parking lot on Otter Creek Rd. then circle back to the parking lot on the north side of the lake on Lake Trail for a nice hike around the lake. Spillway Trail – .25 mile, handicap accessible, mulch trail, rated easy. Makes for a nice short walk if you don’t have much time. Otter Creek Road – 1.05 mile, handicap accessible, dogs and bikes are ok, paved road, rated easy. Many people park on this side of the park and will walk to other trails so it may be tough to find parking. Access Trail – .25 mile, mulch trail, rated moderate. From the east parking lot, the access trail leads you into the more difficult ganier ridge trail or the lake trail that will take you around the lake. South Lake Trail – .9 mile, mulch trail, moderate. Listed as moderate but like the lake trail is on the easier side. South Cove Trail – 1.4 mile, mulch trail, rated difficult and one of the least used trails at Radnor Lake if you are wanting to enjoy the peace and quiet. Ganier Ridge Trail – 1.65 mile, natural trail, rated difficult. Although rated as difficult in my opinion I would rate this trail as moderate. You do have to do a bit of inclined hiking and you may break a sweat heading up to the ridge, but it’s not terribly difficult. If you want the best they’ve got here then definitely try this one out. I’ve spent lots of time in Percy and Edwin Warner parks. Percy Warner Park is a beautiful park in west Nashville with entrances to the park off of Old Hickory Blvd and Hwy 100. Iroquois Steeplechase is held at this park each year. This is when you can find women in huge hats, men in suspenders and bowties, and just everyone dressed to impress while having fun and drinking. Even if you don’t go hiking in the park, even if you never get out of your car, it’s worth a drive through the park. There is a paved road that goes all through the park and lets you see the steeplechase, a great view of downtown, old stone walls and structures, and just some beautiful views of nature. 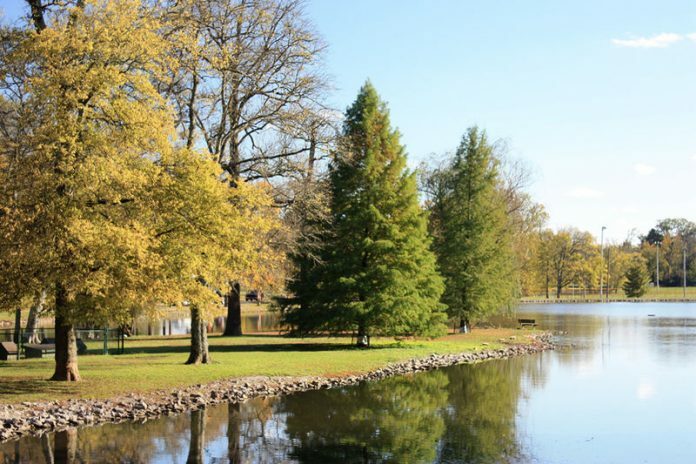 The warner parks are some of the largest in the state spanning over 3100 acres and just 9 miles from downtown Nashville. The warner parks contain 9 trails total listed on nashville.gov however this park is so huge you may find other less travelled trails through exploring on your own. Little Acorn Trail – Another 1/3 mile loop, great for kids. Amphitheater Trail – 200 yards and leads to a stone amphitheater known as the nature theater. Owl Hollow Trail – Yet another 1/3 mile loop trail. This one was built in 1974 and you may spot a barred owl if you look carefully. Warner Woods Trail – 2.5 mile loop trail. Heavily wooded and secluded with some great views. 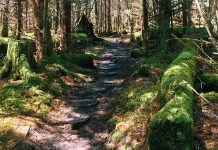 Mossy Ridge Trail – A nice 4.5 mile loop with wide, smooth trails that makes for a great and non-strenuous day hike in the woods. Nature Loop Trail – 3/4 mile loop trail that has 20 stops along the way if you pick up your guide booklet from the nature center. Harpeth Woods Trail – A beautiful 2.5 mile loop trail that crosses a rock quarry and the historic Natchez Trace. This loop has access from 3 different trailheads. Located in east Nashville, Shelby Bottoms and Greenway Natural Area is a beautiful area for enjoying nature and is right inside the city just a few minutes from downtown Nashville. The greenway is over 5 miles long, paved, and handicap accessible. It’s located right on the Cumberland River and allows dogs, jogging, and biking. In addition to the 5 miles of paved greenway, there are an additional 5-7 miles of primitive hiking trails for use. From what I understand about Shelby Bottoms, which I have not visited in a long time, it is broken up into 2 main trails. The west loop and the east loop. 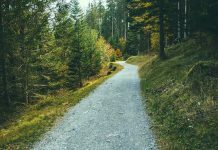 While on either of these trails you will come across and walk on many other smaller trails and I have done my best to list them below. If you are lucky and are there at the right time, you might catch a glimpse of the famous gold pheasant that frequents Shelby Bottoms. East Loop Trail – 8 mile loop accessible year round. Cornelia Fort Trail – Approximately 2.3 miles long and connects to several of the other trails on this list. River Cane Trail – A 1.1 mile trail. Bottomland Trail – A short, .5 mile hiking trail. Native Grounds Trail – .5 mile trail that connects with raccoon den trail. Wildlife Crossings Trail – .6 mile trail. Beaman Park is an almost 1700 acre natural area located northwest of Nashville just inside Davidson County. Open from dawn till dusk, you will find much wildlife and nature at Beaman as well as 3 hiking trails. Ridgetop Trail – 2.1 miles one way and follows along an old logging trail and ridgetop as the name implies. Henry Hollow Loop – 2 mile loop. This peaceful loop trail, slightly reminiscent of the trails at the warner parks, connects to the nature center. Sedge Hill Trail – .6 mile loop trail great for a short hike. A great hiking destination near Nashville with lots of hiking opportunities. Long Hunter State Park boasts over 25 miles of hiking trails with all of them being either moderate or easy. A great location to bring your kids on a hike possibly with a jogging stroller. Several of the trails also allow pets. For more on these trails, please visit tnstateparks.com. Not in Nashville, but just a short drive west from Bellevue in Cheatham county. The narrows of the Harpeth river can be found here and is somewhere I spent a lot of time as a kid. The water is clear and shallow for miles and is great for canoeing or kayaking. You will also find some short, limited hiking trails in the park. Mace Bluff Trail – Only .2 miles up to Mace Bluff but the only trail rated as difficult so prepare for an uphill hike. According to this article, Mace Bluff has some history and you may even see a petroglyph at the top.